After many years of being the foil of a houseful of boys, I'm down to my last son in the nest. Gonzo is an easy keeper. He gets up on time. He's extremely clean, hygiene-wise. When I assign homework (we homeschool), he does it. The bed gets made without asking - after all, I asked him when he was about four...why would I have to ask again? Armed with a supply of frozen pizza, chicken nuggets and the occasional ride to an activity, he basically has all he needs...well, almost all he needs: the boy is like a black hole for headphones. I shouldn't complain. He uses them to listen to decent music (constantly) and when he uses the computer, if any audio is involved. Really, that is pretty nice; our computer is smack dab in the middle of the kitchen/living room area. Anyone watching television or reading will hear the computer. Extra credit given for manners. At the beginning of the electronic era (here at Cherdo-land), we each had ear buds. The kid who never breaks anything ever came to me and said his ear buds were not working or had started to decline in performance. No problem, son - use mine. At that moment, they ceased to be mine, whether I realized it or not. Soon, those cheapo ear buds started to crackle...no problem, son, I just bought another pair - use mine, I cheerfully offered. I upgraded to headphones; I never really liked the ear buds that much, anyhow. This was the beginning of the audio jockeying that is my life. Because he listens to books and music as we travel to activities, too, Gonzo started stashing his ear buds in the car...he could conveniently use my headphones in the house. In fact, soon I could never use my headphones - they were attached to his head every time I wanted to use them. Mentally, he owned them...it was like Spy vs. Spy and the goal was getting to the headphones first and I was losing! Taking the high road, I gave him my headphones. Now he had ear buds for the car, and headphones in the house. I knew someday, one of those would break, so I planned my next move to head off problems. In short order, I got another pair of headphones - but with a twist. I know Gonzo's Kryptonite is anything that looks girlie. 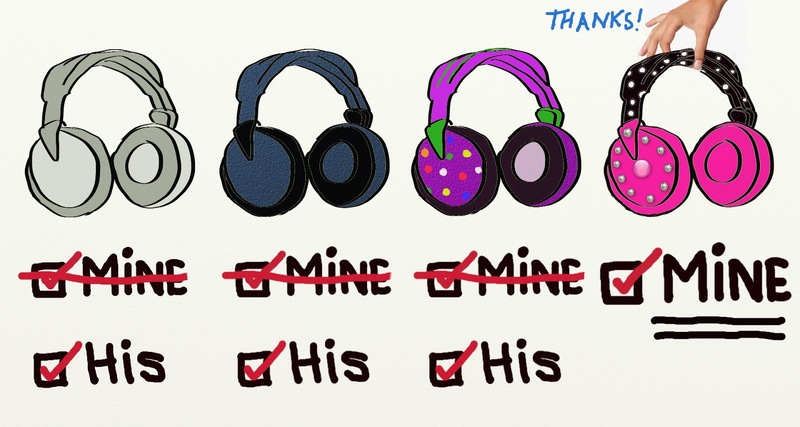 Truth be told...I don't like girlie all that much, either, but I put that preference aside and I went shopping specifically for headphones that looked like they belonged to a female and found some purple ones with multi-colored polka dots. It should have been dude crushing. But I noticed that his old headphones replaced the ear buds in the car...and guess what he was using? The purple polka dotted headphones. Inquiring about the newly "acquired" gear, I asked Gonzo if the headphones weren't a bit...dare I say?...GIRLIE? A tad bit feminine? "Naw, it's fine," he replied. Having now secured headphones for the cars and living room, he was pretty well set. But there's the rub. I'm the Mom who wants to teach him to share - in theory - and it makes me feel selfish even when I just want my own headphones...then the little devil on my other shoulder speaks and I think about how many pairs of headphones I buy and never get to use. Soon my thoughts turn to inner rants. They cut that kid from my body, the least I deserve is a pair of headphones! Lurking in the electronics department the following day, I saw a bright hot pink pair of headphones with a black and white polka dot band. The ear pieces also sported a ring of rhinestones and the cheery message: BE YOU TIFUL. Bingo!! An estrogen victory. The very next day, the car headphones broke. Turns out he is secure enough in his teen manhood to wear the hot pink ones. Game, set, match.